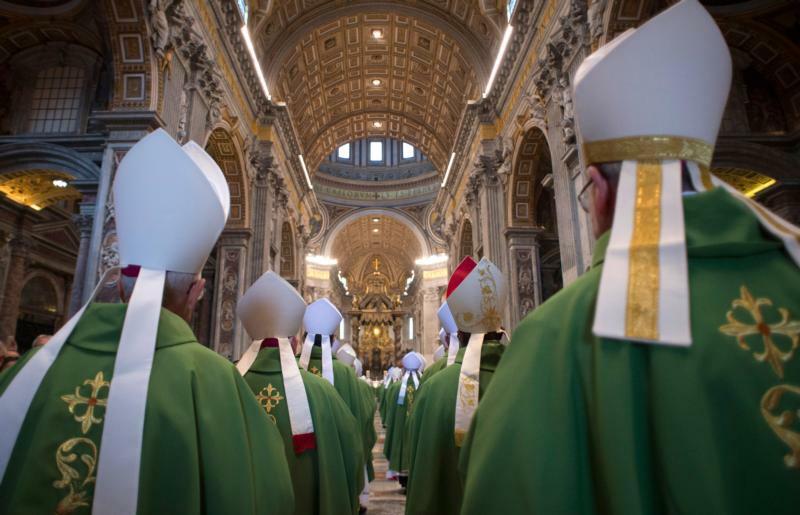 VATICAN CITY (CNS) — From newspaper headlines and social media comments Oct. 12 it seemed there was a family feud going on inside the Synod of Bishops on the family. Some cardinals — apparently 13 of the 74 cardinals participating in the synod — wrote Pope Francis a private letter expressing concern about a part or parts of the synod procedure, especially the appointment of a 10-member committee to draft the final document the synod will vote on and give to the pope. The names of the cardinals signing the letter changed over the course of the day, with four declaring they did not sign any letter and two others saying the leaked letter published by Italian blogger Sandro Magister is not the letter they signed. “I recognize that the appropriate place of discussion is with other synod fathers and under the guide of the pope, who is our guarantor of unity in the church and who has my utmost respect and loyalty,” Cardinal Rivera added. The synod is supposed to be a process true to the Greek roots of the word meaning “walking together.” Perhaps more than a family feud, what happened in mid-October was a family walk. Anyone with a big family — or even with just a couple very young members — knows how hard it is to keep everyone moving at the same pace and on the same trail with no arguments over rest stops or detours. Jesuit Father Federico Lombardi, Vatican spokesman, said concern expressed in a private letter — not Magister’s leaked and published “letter” — that Australian Cardinal George Pell and South Africa Wilfrid F. Napier said they sent the pope were addressed by Pope Francis and by Cardinal Lorenzo Baldisseri, the synod general secretary, first thing in the morning Oct. 6. Cardinal Pell told the news site Vatican Insider Oct. 13 that he was “fundamentally satisfied” with the pope’s response. Pope Francis and members of the synod on the family, along with other guests, were scheduled to celebrate the 50th anniversary of the establishment of the Synod of Bishops Oct. 17. Blessed Paul VI established the synod to assist him in governing the universal church by providing him with counsel based on information and observation drawn from their pastoral and theological experience around the world. It is not a deliberative body like a parliament. Pope Francis, a Jesuit, has made changes in the synod process to expand the time for dialogue and to create the time and space needed for discernment in the style of St. Ignatius of Loyola, the Jesuit founder. When the Holy Spirit speaks, tensions can rise. But that can be positive because it shows “that the spiritual process is active. It would be bad if there were a dead calm,” Father Spadaro said. More worrying, he said, is the fact that the letter leaked to the press expresses concerns that could be interpreted as questioning the authority of the pope.